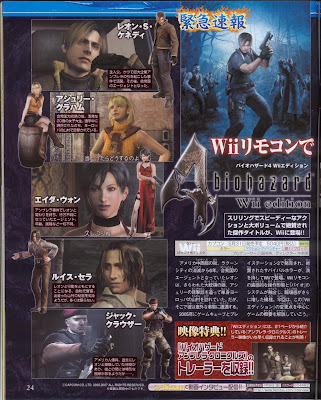 NintenGen: New Resident Evil: Umbrella Chronicles and RE4 Wii shots! New Resident Evil: Umbrella Chronicles and RE4 Wii shots! This from the Neogaf gaming forums. Umbrella Chronicles definitely has the most realistic graphics on the Wii yet. RE4 looks great as to be expected. More to come. The graphics will be done totally in real time on the Wii; also you will be able to look around with the Nunchuck's analogue stick to find clues and secrets. When you are doing certain "moves" with the Wiimote the game will switch to 3rd Person view so you will be able to see your character on screen during these moments of non shooting action. 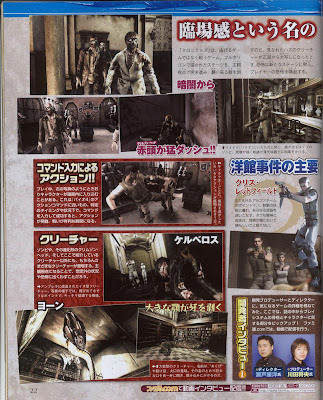 Capcom has also said that Umbrella Chronicles will serve up plenty of scary moments, so this is not just a "House of the Dead" that looks like a Resident Evil game. I'm looking forward to it. I heard from IGN that Resident Evil: Umbrella Chronicles is 25% done. From what I see on the scans, the game doesn't look 25% done. But if it's true, then I can wait to see what the final product looks like! Very true. 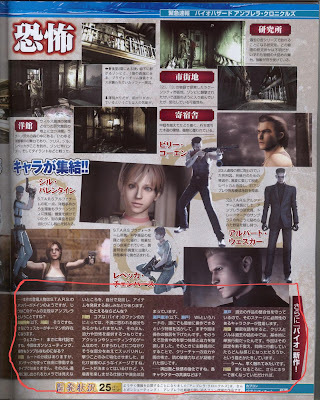 It looks like at least one part of the game is done, the part of the game that takes place in Resident Evil 1. Also thanks to all those who came to my site yesterday. I had the most amount of traffic here ever with over 4,500 hits! Thanks for all the love everyone.